WAGONS HO! The wheels are turning and we are starting to work hard on Days of 49 Wagon Train 2015. 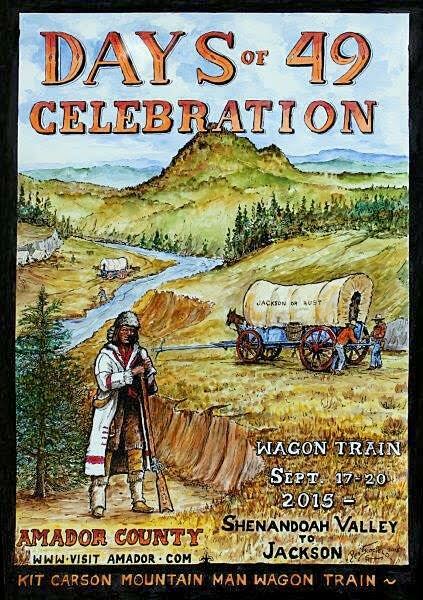 Fiddletown artist and honest-to-God cowboy Ron Scofield has produced another very collectible poster for the 2015 Wagon Train. Great job, Ron! The poster will go on sale at the Amador County Fair (July 23rd - 26th) by the Kit Carson Mountain Men. Poster will also be available at local stores/chambers and during Wagon Train Sept. 17 - 20. July 1, 2015 - Now that ground was broken at the Miners’ Bend Park on South Main, the Sutter Creek Community Benefit Foundation is excited to move on to the second major phase of the Sutter Creek Grammar School Restoration. Timing is critical as most work on the Grammar School must be done during summer break. The restoration work on the 145 year old, Historic Sutter Creek Grammar School is well underway. The initial major improvements have been focused on the front entrance and first floor of the building. The bell tower has been repaired and repainted; the front stairs are currently being replaced by concrete stairs as existed from the mid-1920’s through 1985; the front porch is being renovated and the south side entrance is being rebuilt. The $40,000 cost of these four major projects was funded entirely by local private and corporate donations. Although impressive progress has been made, there is more to do before the building can be returned to active use by the community. SCCBF plans to reoccupy the first floor and part of the second floor by this fall. In order to do so we have a lot of cleaning up and finish work to be done on the interior and exterior of the building. SCCBF is looking for volunteer labor to help complete a long to-so-list with tasks for every skill level. SCCBF will be hosting a volunteer-open-house-sign-up-recruitment- day on July 15th from 6:00-8:00 at the schoolhouse. The event is intended to provide the interested public with a first hand look at our progress and remaining challenges, as well as to recruit volunteers to provide the funds and/or labor to finish the remaining cleanup and minor interior improvements. A major scheduled work day will follow on July 25th from 8:00-5:00 with a barbecue to follow. The stated purpose of the restoration project is to return the building to public educational, service and recreational use. Many different proposed uses have been discussed including a Sutter Creek Museum. The museum is proposed to provide local residents with a centralized site to honor and celebrate our local mining, cultural and personal histories. The Sutter Creek Community Benefit Foundation is dedicated to the restoration, preservation and development of the community’s historic assets. Under the umbrella of the Amador Community Foundation, we offer all the tax benefits of a 501 ( c ) 3 Community Benefit Not for Profit Organization. • Increase public awareness of our diverse history and our cultural heritage. • Provide a mechanism to facilitate private giving for public good. • Build and maintain the financial resources needed to respond to community needs. • Address those needs through grant making. • Provide an opportunity for individual citizens to make a lasting contribution to our community. GRAMMAR SCHOOL WORK PROJECT LEADERS NEEDED! Now that we've broken ground (and even stopped traffic) at the Miners' Bend Park on South Main the Sutter Creek Community Benefit Foundation is excited to move on to the second major phase of the Sutter Creek Grammar School Restoration. Most construction work at the Grammar School is limited to during summer break and we have a long to do list - NOW WE NEED YOUR HELP! The restoration work on the 145 year old, Historic Sutter Creek Grammar School is well underway. The initial major improvements have been focused on the front entrance and first floor of the building. The bell tower has been repaired and repainted; the front stairs are currently being replaced by concrete stairs as existed from the mid-1920's through 1985; the front porch is being renovated and the south side entrance is being rebuilt. The $40,000 cost of these four major projects was funded entirely by local private and corporate donations. Although impressive progress has been made, there is more to do before the building can be returned to active use by the community. We plan on being able to reoccupy the first floor and part of the second floor by this fall. In order to do so we have a lot of cleaning up and finish work to be done on the interior and exterior of the building. Many of you have asked how you can help (aside from financial contributions) and now is the time. We will be hosting a volunteer-open-house-sign-up-recruitment- day on July 15from 6 to 8pm at the school. The event is intended to provide the interested public with a first hand look at our progress and remaining challenges, as well as to recruit volunteers to provide the funds and/or labor to finish the remaining cleanup and minor interior improvements (we have a job for everyone at any skill level). The scheduled workday will be held on Saturday July 25 from 8am to 5pm with a BBQ to follow. With your help and continued public support we can open up part of the Grammar School this Fall and enjoy this unique part of our local history for many years to come. As you know the new city park located on the south end of Main Street has been officially named Miners' Bend Park. Not only does this name have a ring to it, but it also has a historical significance. Below is the design map for the "new" highway - this map is from the late 1920s. On the map the area of the Miners' Bend park and the apartments is in that area labeled "Camp Grounds, Central Eureka Mining Company." On that same hill side is a spring that runs year round and back in the time of horses there was a watering trough in this area to water the horses before they headed up the hill. Please see the History Corner section below for more historical information on the area across from Miners' Bend Park. As a progress update on the Park, foundations were poured last week to support the historic stamp mill and compressor that will be displayed in the park. For those who wish to donate or volunteer please contact Frank Cunha at 3049192 or frankc49@comcast.net. 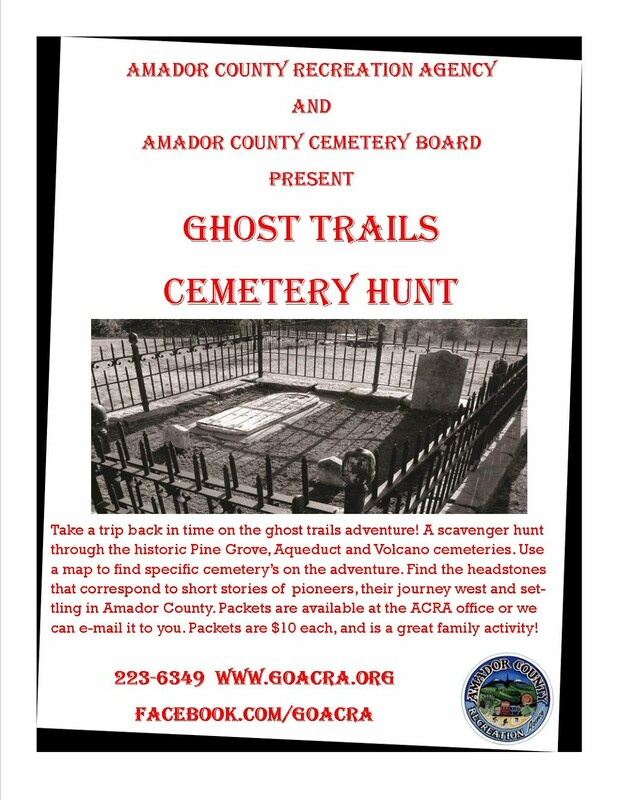 Sutter Creek History Corner - "The Amador War"
of land that came to be known as "Camp Colton." Camp Colton was located on Old 49 across from Miners' Bend Park on the knoll between the highway and Skunk Hollow was a California Militia Camp known as Camp Colton. The knoll is in the foreground of the photo from 1891. You can see the gash in top of the knoll and the remains of a mining operation. The militia helped to resolved the dispute peacefully and the only demand that was meet by the mining company was the removal of the Chinese miners.